Despite industry evolution and changes in the way the world thinks about yachts, boats and vessels, the wood boat survives and has withstood the test of time. Among the wood boats that have survived is the wood Beetle Cat sailboat which will reach its 100th anniversary in 2021. 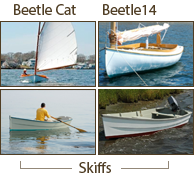 The Beetle Boat Shop is dedicated to preserving the art of traditional Plank-On-Frame wood boat construction, using the highest quality of materials and craftsmanship while providing a source for new wooden Beetle Cat sailboats. 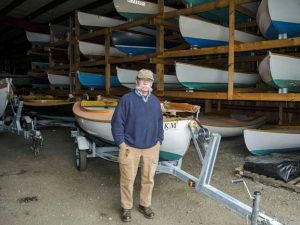 In addition, the Beetle Boat Shop offers a full service boat yard for the Beetle community and Beetle sailors for maintenance, repairs, paint, parts, storage, and transportation. Because the Beetle Cat is one of the oldest one designs still being constructed out of wood and actively raced, it is part of the Beetle Boat Shop’s mission to support and synchronize with the New England Beetle Cat Boat Association (NEBCBA) in providing an active racing environment for the Beetle Cat sailor. 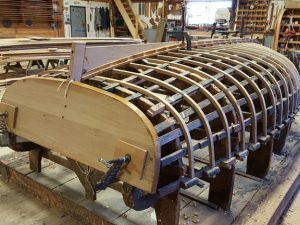 While building and maintaining the Beetle Cat is our main focus here at the Beetle Boat Shop, we are also reaching out to design, build, restore and maintain larger wood boats of all kinds. The effort we have made to date will be evident as you explore our website.